Instructions: Cut a piece of white cardstock 10" x 7", score at 5" along the long side and fold to create a base card of 5" x 7". Die cut the two tags from the paper collection using the tag die from the HCD1-7201 Ticket & Tags Die set. String the hemp twine through them and then adhere to the card front. Cut a piece of patterned paper with the yellow and orange coneflowers 5" x 7" and adhere to the front of the card hiding the ends of the twine. 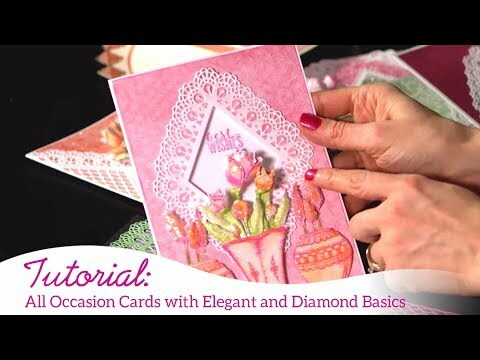 Add Diamond glitter to the flower images on the paper using Dries Clear Glue. Add an orange ribbon bow and glue over the twine to hold the tags together. Finish with a stud. Die cut 1 large eyelet diamond out of white cardstock. Die cut a plain coordinating diamond from the light green patterned paper and adhere to the eyelet diamond. Die cut the second size eyelet diamond from white cardstock and adhere to the front of the previously cut diamond. Die cut the coordinating sized basic diamond from the light green patterned paper and adhere to the diamond stack. Die cut the third size diamond and add Frosting Powder to the front. Adhere this diamond to the diamond stack. Die cut two of the third size eyelet diamonds out of white cardstock. Die cut the corresponding plain edge diamond out of the light green paper and adhere to the diamonds. Adhere the diamonds to the front of the card as shown. Adhere the eyelet diamond stack to the base card. Stamp the coneflower image from the HCPC-3828 Garden's Edge Coneflower stamp set in Monarch Orange and Fern Green inks on Iris cardstock. Colour the stem with Leaf Green ink and the coneflower head with Buttercup and Tangelo inks. Shape using the Deluxe Flower Shaping kit and add Crystal Clear glitter to the flower, leaves and stem and the Bronze party balls to the Coneflower head. Add the flower to the front of the diamond stack. Add pearls to all the layers of the diamonds as shown.